Coming up with table centerpieces for Easter dinner or brunch tables needn't cause extra stress. With all the food preparation you'll likely be doing you don't want to spend more time than necessary dressing up your table. So, check out some of these simple ideas for creating great table centerpieces for Easter. When it comes to decorating tables for Easter think about the themes and images that are closely associated with the holiday. Eggs, spring flowers, pastel colors are among them. When using floral centerpieces there are a few things to keep in mind. Remember to purchase the flowers early enough so they have a chance to open up before the meal, but not so early they'll die before the guests arrive. Speak to a florist before buying, but two days is usually a safe bet. Also remember not to get any flowers that are too fragrant. When really fragrant flowers are on the table it can affect the way diners smell and taste the food that's served. Spray paint a wicker basket in a soft pastel color. Place a piece of floral foam (cut to fit the basket) inside and fill it with seasonal flowers to match (or compliment) the basket. Carnations are inexpensive and look great when they're used in large quantities. When you're placing the flower in the foam push it right down so that none of the stem is visible. Fill in the entire area so that none of the floral foam is visible and you'll have a lush and luxurious display. Create an odd number of flower balls (three is always a good amount) by sticking flower blossoms into a Styrofoam ball or round ball of floral foam. These can be made with fake flowers, but the real thing always looks better. 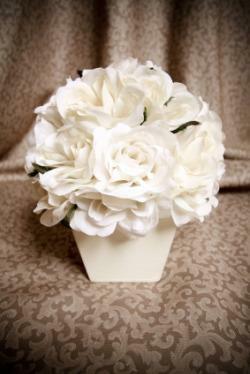 Use enough flowers and place them tightly together on the ball so that no Styrofoam or floral foam is visible. Place them atop pedestals such as vases or candlesticks and place them in the center of the table. Alternatively, add ribbons and hang them from a chandelier that's hung over the table for a unique twist on the traditional centerpiece. Use eggcups and hollowed-out eggshells to create tiny vases then place a collection of them in the center of the table. To create height you can place them on a cake stand. Simply break an egg at the top of the shell, empty out the contents and rinse it out well, fill it with water and some lovely little flowers and place it in a simple eggcup. Either use these as centerpieces or put one at each place setting. For a formal meal, use a silver wine or champagne bucket as a vase to create an elegant look. Fill it with calla lilies or another elegant seasonal flower and place in the center of the table. Don't be afraid to think outside the box. There's more to table centerpieces than just flowers. For a cheap and cheerful display take three clear glass vases of varying sizes and fill them with small decorated eggs. The eggs can be store bought candy versions, eggs that you've decorated yourself, or spray painted eggs that match your Easter décor. A cake stand filled with candles and Easter-inspired accents is a fun and sophisticated alternative to traditional centerpieces. Playful ceramic or metal bunnies, hens, or other accessories spray painted in a matching color adds a touch of whimsy to the table. Collect branches from the backyard or get a paper tree from a craft store and spray paint in an Easter-inspired color that matches your table décor. Place them in an opaque vase, or a clear vase filled with little eggs, and then hang tiny tags off the branches. On the tags write all the items that will be served at the meal. It's a combination centerpiece/menu. When creating table centerpieces for Easter it's important not to overdo it. Keep things simple and use centerpieces that either match or compliment the rest of the décor. While centerpieces often become the focal point of the table, they shouldn't overwhelm or distract from the meal.